The Spanish Peseta was the currency of the Kingdom of Spain from 1869 until 2002, when it was replaced by the Euro. 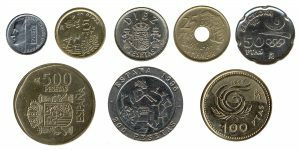 The name ‘peseta’ is a diminutive of ‘peso’, meaning ‘weight’ and ‘piece’, referring to the famous ‘piece of eight’, first struck as a silver coin in the 16th century with a value of eight reales. Spanish Pesetas are now obsolete. At Leftover Currency we specialize in the exchange of obsolete currencies, like the Spanish Peseta. Our online exchange service is quick, easy, secure and free of charge. We exchange both Spanish pesetas coins and peseta banknotes.